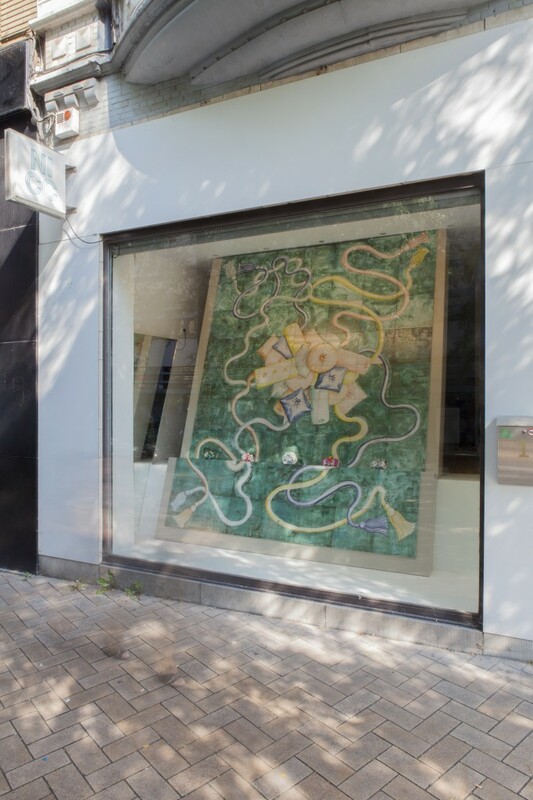 NICC is very proud to present a new vitrine presentation by Italian born and London based artist Patrizio Di Massimo (1983). Recently, Di Massimo has focused on figurative painting in which he combines a twisted classical iconography and composition with a contemporary sensitivity for domains that border art, especially fashion and decoration. At NICC, the artist self-consciously returns to elements of his work he cut off a while ago: the use of domestic objects, such as cushions or tassels, this time not used as representational tools for the human body but with openly decorative features. Di Massimo’s vitrine exhibition is a heterogeneous collaborative installation based on a previous show at Cura Basement (Rome). 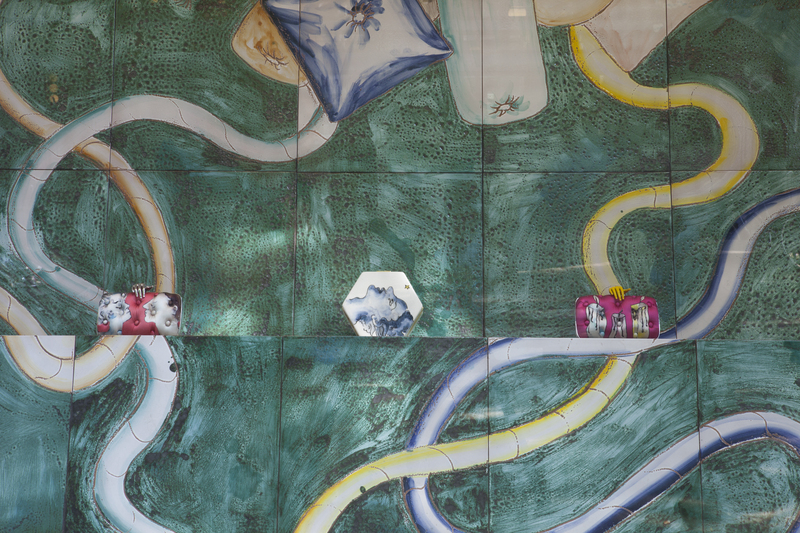 There – in what looked like a commercial display as much as an art installation – he combined ceramic tile floors, new paintings, and a collection of handbags made in collaboration with fashion designer Benedetta Bruzziches. At NICC, the installation will be adapted to the context of a (shop) window. 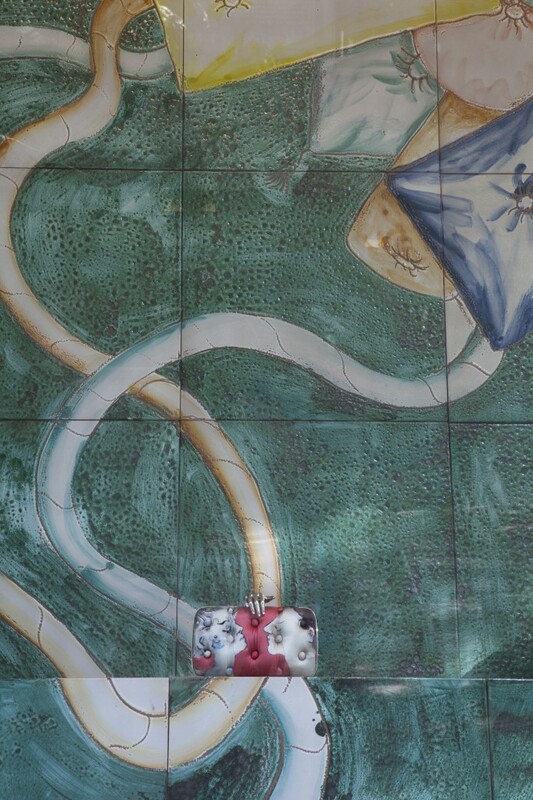 The tile floor will be presented vertically, transforming itself into a painting that serves a backdrop for the selected handbags displayed in front like in a proper shop. As a whole the installation can be seen as a blend of bidimensionality and tridimensionality, the fine and the applied. For the opening evening, Di Massimo invited Belgian artist Lili Dujourie, who will conversate with Anders Kreuger, curator at M HKA, with whom Di Massimo collaborated in 2014 for the group show ‘Don’t you know who I am’. Although with a very different approach Di Massimo and Dujouri shares a significant interest in similar materials and media. Dujourie, who recently had acclaimed survey of works at S.M.A.K. and Mu.ZEE, will unfold her complex and singular oeuvre during this special evening event.